"There are circumstances, as you approach a yellow light, where the decision is easy. If you are close to the intersection, you keep going. If you are far away, you stop. If you are almost at the intersection, you have to keep going because if you try to stop, you could cause a rear-end crash with the vehicle behind you and would be in the middle of the intersection anyway," said Rakha, professor of civil and environmental engineering at Virginia Tech. He's not trying to defend his action. Rakha, director of the Center for Sustainable Mobility at the Virginia Tech Transportation Institute, is describing his research. Since 2005, his research group has been studying drivers' behaviors as they approach yellow lights. Their goal is to determine signal times for intersections that are safer and still efficient. "If the yellow time is not set correctly, a dilemma zone is imminent," Rakha said. "The dilemma zone occurs when the driver has no feasible choice," he said. "In other words the driver can neither stop nor proceed through the intersection before the light turns red. This can also occur if the approaching vehicle is traveling faster than the posted speed limit and/or if the driver's perception and reaction time is longer than the design one-second value." In most cases, the yellow time is set for 4.2 seconds on a 45 mph road. The time is longer for higher-speed roads. "These timings are based on two assumptions," Rakha explains. "Namely, the driver requires one second to perceive and react to the change in signal indication and that the driver requires 3.2 seconds to stop from 45 mph at a comfortable deceleration level, assumed to be 3 meters per second squared (3 m/s2 ) or 10 feet per second squared." For his studies, Rakha's used Virginia's Smart Road, located at the Virginia Tech Transportation Institute. The Smart Road intersection has a signal that can be controlled for length of the red, yellow and green lights. "We can study driver behavior by changing the signal when the driver is a certain distance from the intersection." The specific findings from the Smart Road study are that 43 percent of drivers who crossed the stop line during the yellow time were not able to clear the intersection before the light turned red. At 45 mph, it takes 1.5 seconds to clear a 30-meter (98.4 feet) intersection. 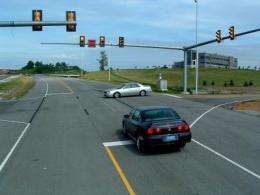 "If the all-red interval is the minimum conventional one second, then there is a potential risk that the legal yellow-light runners would not be able to completely clear the intersection at the instant the side-street traffic gains the right-of-way," the researchers reported at the Transportation Research Board Annual Meeting in 2010. "Even if yellow timing is designed properly to avoid a dilemma zone, someone driving above the speed limit could encounter a dilemma because it takes longer to stop from a higher speed. They could speed up, but our studies show that drivers who keep going usually maintain their speed," Rakha said. If the road conditions are poor, drivers react 15 percent slower because they are processing more information. Deceleration level decreases by 8 percent. "In such conditions, you need a longer yellow," Rakha said. A future strategy that researchers are investigating is in-car display systems that can be customized to each driver's reaction time. "So one person receives a four-second warning of a light change, and another person receives a five-second warning. Or, instead of a warning, the system might just tell you to stop," said Rakha. Research to implement vehicle-to-vehicle and infrastructure-to-vehicle communication is ongoing, including at the Virginia Tech Transportation Institute Tier 1 University Transportation Center. Rakha's research group is studying vehicle-to-vehicle communication at intersections. "Novel Stochastic Procedure for Designing Yellow Intervals at Signalized Intersections," by Ahmed Amer, transportation engineer with Vanasse Hangen Brustlin Inc.; Rakha; and Ihab El- Shawarby, assistant professor at Ain-Shams University in Cairo and senior research associate with the Center for Sustainable Mobility at the Virginia Tech Transportation Institute. It appeared in the June 1, 2012, Journal of Transportation Engineering. "Designing Yellow Intervals for Rainy and Wet Roadway Conditions," by Huan Li of Blacksburg, who has received his master of science degree in civil engineering; Rakha; and El-Shawarby. The article appeared in the spring 2012 issue of the International Journal of Transportation Science and Technology. Many intersections now have the walk signal count-down feature that is very helpfully in judging when a green light is about to turn yellow. However I have been noticing more and more of them that count down to zero and then nothing happens, screwing up that advantage. Experienced drivers tend to get accustomed to the traffic lights they encounter daily; varying any of their parameters might actually throw them off (e.g. I know I can safely get through this intersection without running a red light but the yellow time has decreased and now I'm in trouble). The story I heard was a study here in Texas indicated that increasing the length of yellow lights would decrease accidents. At the same time, it indicated that decreasing the length by a quarter second would result in more accidents, but more revenue for the city. Many towns proceeded to reduce the length of the yellow, opting for revenue at the cost of lives. Then again, this is Texas. Or if a light in front of you turns yellow, stop if you can safely do so. Like the law says. And if you rear-end someone stopping for a yellow light - well - you should have been stopping as well, not trying to push them through the intersection because that 2 minutes is critical to your McDonald's being hot when you get home. City governments are the worst offenders for causing traffic safety hazards. I have seen traffic lights that take only two seconds to change from green to red. There is no way to quickly stop a loaded commercial truck at an intersection when the light quickly changes so the driver will honk the horn and flash the headlights and hope the other vehicles wait. State and federal traffic safety rules need to be enforced to stop city governments from tampering with stop lights and building hazards that obstuct traffic and cause accidents. Or if a light in front of you turns yellow, stop if you can safely do so. Like the law says. Things aren't as simple as you want them to be, Mike. When did you see the light turn yellow? Everyone has different perception/reaction speeds, that deteriorate as we get older as well. Was there another potential hazard that took your attention away and you missed 1/2 of your perception window? Did the city reduce the time you have to react on purpose in order to catch more people? Did the car in front of you have poor reaction time? Does the traffic around you have different ideas of what's a reasonable stopping distance? Don't assume everyone is trying to break the law to get to McDonald's. We have varying limitations, and there are people who purposefully reduce the window for us to exercise those limitations. The US is getting more and more of those red light cameras. In some parts of the country it is considered great sport to shoot them out with hunting rifles. I wish I could give a medal to everyone who does. I have recently seen much better traffic lights in Havana of all places! Mostly every traffic light in Havana have a timer showing how much time until the light turn red - not for walkers but for drivers! The countdown numbers are relatively big and you can easily see the numbers from a few hundred meters away. Seeing the light will turn red in lets say 8 second and you are 100 meters away on a road going 60km/h and you know you cannot get over in time. Not only does it seem to help traffic, but this actually seem to reduce total fuel and corresponding pollution too! The yellow light may not be needed for anything but as a backup? None of that matters. All that matters is "the light is yellow NOW. Can I safely stop NOW?" If the answer is no and you run a red light, then you run the risk of death or taxes.